To Temeraire on the "Ships starting with T" page. Source for both pictures: Bjørn Pedersen's collection. Another picture is available at Lillesand Sjømannsforening's website - see this page. Tonnage: 6465 gt, 3926 net, 9488 tdwt. Machinery: Two 8 cyl. 4 scsa oil engines totalling 7740 ihp by the shipbuilders, driving twin screws. Service speed 14.5 knots, 12 passengers. Launched on May 28-1927 by Chantier et Ateliers de St. Nazaire (Penhoët) S.A., St. Nazaire (Yard No. U 5), completed Dec. 17-1927. Captain: Albert Toft (previously Talabot's captain). Guestbook message - From the son of Haakon Werner Hofsten, who sailed on Temeraire, as well as Mosfruit, Somerville, Gausdal, Evanger and Belinda. Another Guestbook message from someone whose father, Bruce Gamble, served on Temeraire as well as Troja. March 4 Milford Haven   OB 103 For Massawa. With OA 103, formed OG 21F March 5. March 5 Formed at sea Gibraltar March 8 OG 21F For Massawa. Nov. 20 Bunbury Sydney, N.S.W. Nov. 30* Independent *Page 1 gives arrival Nov. 26. Febr. 20 Port Sudan   BSF 2 Dispersed Febr. 22. Nov. 15 Milford Haven   CT 6 Detached Nov. 24. Aug. 28* Guantanamo Key West Aug. 31 TAW 15G Joined from Gitmo. *Page 2 gives departure Aug. 26. Oct. 30 Liverpool   ON 142 For Bombay, 8 Passengers. (via Port Pirie - See Page 3). July 6 Melbourne Sydney, N.S.W.  Independent Page 3 gives arrival July 8. July 19 Sydney, N.S.W. Newcastle, N.S.W. July 19 Independent Missing voyage to Sydney & back? Sept. 21 New York City Avonmouth Oct. 2* HX 310 *Page 3 gives arrival Oct. 5. May 6 Southend   ON 301 Detached independent May 18. In Febr.-1940, Temeraire is listed, along with Garonne and Bruse Jarl, in Convoy HGF 18 from Gibraltar, bound for Swansea, station 34. The following month, we find her in the Gibraltar bound convoy OGF 21, a combination of Convoys OB 103 and OA 103, which joined up on March 5, both having departed U.K. on March 3. Bruse Jarl is again listed, as is Einar Jarl. Temeraire's destination is given as Massawa - according to Page 1 of the archive documents, she was bound for Miri and Osaka. She had started out in Milford Haven on March 4, joining Convoy OB 103 (ref. link provided within the Voyage Record). The OG convoy will be added to an individual page in my Convoys section, but for now, the ships sailing in it are named on the page listing ships in all OG convoys. With a cargo of wheat, steel and wool, she's also listed in Convoy SLF 41, which left Freetown on July 28-1940 and arrived Liverpool on Aug. 14 (having joined up with Convoy SL 41 on Aug. 8). The company's Tancred (from SL 41) and Tricolor are also included. The following month we find Temeraire, together with Inger Lise, Tarifa and Victo, in Convoy OA 208, departing Methil on Sept. 2, dispersed Sept. 6. Her destination is not given (see link in the Voyage Record), but from the archive document, we learn that she arrived Trinidad on Sept. 17, later proceeding to Galveston and on to Australia. 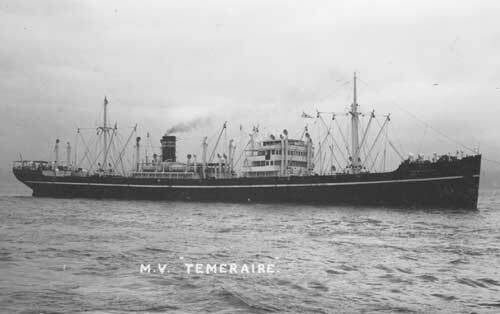 According to J. R. Hegland's "Nortraships flåte", Temeraire was in Liverpool during the 5 day air attacks there at the beginning of May-1941 (see Sollund), but escaped with minor damages. Note, however, that this can't be correct - she was in another part of the world at this time; again, see Page 1 (Hegland also claims Tai Yin was there, but she was also in a different part of the world; follow the link for voyage details). Skipping now to Oct. 5-1941, when Temeraire is listed in Convoy HX 153 from Halifax to the U.K., together with the Norwegian Katy, Haakon Hauan, Sveve, Ferncastle, Bonneville (returned), Lista, Santos, Andrea Brøvig and Toronto (returned). Her subsequent voyages are shown on Page 2 (convoy information for some of these can be found in the Voyage Record above). It'll be noticed that she later spent a long time in New York. She had arrived there from the U.K. on Nov. 27-1941; departure is given as March 27-1942 - the reason for this long stay is not known (similar gaps, though not quite as long, are shown elsewhere in her record as well). On Sept. 17-1942, she can be found in Convoy HX 208 from New York, bound for Liverpool; she's mentioned among the ships in the Halifax portion, but she did join from New York. The Commodore's report is also available for this convoy (Temeraire is noted for good station keeping in the text under Oct. 1 in the report). She later joined the westbound North Atlantic Convoy ON 142, which left Liverpool on Oct. 30 and arrived New York Nov. 21. Temeraire, however, headed to Capetown, where she arrived Dec. 6, later continuing to Karachi and Bombay (Page 2) - A. Hague says she had been detached from the convoy on Nov. 11. This convoy will also be added to my Convoys section; in the meantime, the ships sailing in it are named in the section listing ships in all ON convoys. Bestik (returned to port), Carmelfjell, Fjordheim, Jenny, Kirsten B (joined from Halifax), Norvarg, Primo (also from Halifax), Rio Verde, Sevilla (from Halifax), Solitaire and Vinland are also listed. 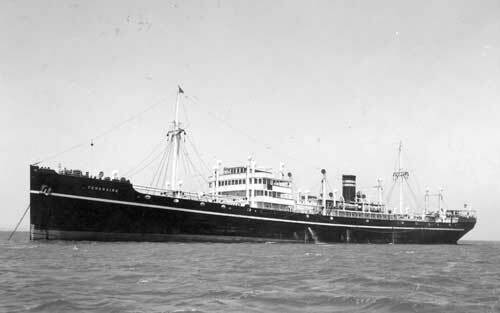 It must have been while on this voyage that she rescued 42 survivors from the British liner Dunedin Star, north of Walvis Bay, coast of West Africa, in Nov.-1942 (this ship had previously left the U.K. with Convoy ON 145, wrecked on November 29). Temeraire's motor lifeboat, under the command of 1st Mate Jacob Brochmann was launched and 10 men were taken off Dunedin Star, but the boat took in a lot of water, causing the motor to stop, so that they had to row for an hour and a half before the rescued could be handed over to Manchester Division, which had also come to. The lifeboat crew was now too exhausted to continue, so the boat was hauled back on board Temeraire. The following morning a tug arrived from Walvis Bay (Sir Charles Elliott), but in the end Temeraire's lifeboat had to be lowered again and the remaining 32 still on board Dunedin Star were taken off in 4 trips. Over 60 people (incl. women and children) from the ship had previously managed to get ashore, and had a trying time before they were rescued after 2 weeks. Captain Toft had considered it perfectly possible to rescue those as well, but was told by Dunedin Star's captain that a seperate rescue team from land would take care of them and Temeraire was sent on her way. When Toft later heard of their ordeal, he was quite upset. A book has been written about this event, see link to "Skeleton Coast" below. Page 2 also has some of her 1943 voyages and as can be seen she had quite a long stay in Sydney that year. Page 3, which lists the rest of her 1943 voyages as well as most of her 1944 voyages, also shows some long stays in port. In Sept.-1944, she's listed in Convoy HX 310 from New York, bound for Avonmouth with a general cargo and mail, arriving that destination on Oct. 5, according to Page 3. The Norwegian Reinholt had acted as Commodore Vessel for this convoy, while Høyanger had the Vice Commodore on board (named on my page about this convoy). Acanthus, Rose and Tunsberg Castle are named among the escorts (see HX convoy escorts) - see also Buttercup. As will be seen when going to Page 4 of the archive documents, Temeraire spent a long time in North Shields, where she had arrived on Nov. 22-1944. The next departure date shown is Apr. 9-1945 "for trials", returning to North Shields that same day. On May 2, she sailed to Southend and according to this posting to my Ship Forum by Temeraire's 2nd radio operator, Dave Jeanes, she departed her anchorage off Southend on May 7 in order to sail independently to Melbourne, via the English Channel and then Panama. She is, however, included (by A. Hague) among the ships in the westbound North Atlantic Convoy ON 301, which departed Southend on May 6 and arrived New York May 22, but Temeraire is said to have detached from the convoy on May 18. She arrived Cristobal on the 26th, then proceeded to Melbourne, where she arrived June 23. Dave Jeanes names the 1st radio operator as Edwin Mortensen. His posting stemmed from some notes in my text for Havfru. The ships in ON 301 are named on this page, Egda, Haakon Hauan, Havfru, Høyanger (Commodore Vessel), Norvarg, Skaraas and Thorshov are among them. Page 4 indicates that Temeraire headed home to Norway at the end of Dec.-1945, but arrival Norway is not given. Sold on Jan. 28-1955 to H. Vogemann, Germany and renamed Vogesen. Arrived Hamburg on Nov. 13-1958 to be scrapped by Eisen & Metall K.G., Lehr & Co.
Stavern Memorial commemoration - Motorman Martin Anker Bjelkevik is said to have died following a "war related act" against the ship. "Våre falne", which names Norwegians who died during the war, gives the date as July 4-1941, when Temeraire was in the Pacific; he was buried at sea. Cause of death is not given. Note that according to Page 2 of the archive documents, Temeraire arrived Aden from Suez on that date. Back to Temeraire on the "Ships starting with T" page. Wilhelmsen had 3 ships by this name through the years, this was the 2nd one. The text on this page was compiled with the help of: Wilh. Wilhelmsen fleet list, "Nortraships flåte", J. R. Hegland, "Skip og menn", Birger Dannevig, and misc. - (ref. My sources).